An air ambulance serving Hampshire and the Isle of Wight takes to the skies for the first time on Sunday. The new service is based at Thruxton Airfield near Andover but may move if a more central site becomes available. The new helicopter will be able to land at hospitals in Basingstoke, Bournemouth, Salisbury, Portsmouth and the Isle of Wight. 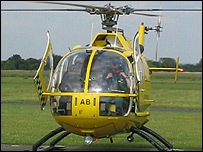 The air ambulance relies completely on charitable donations and needs to raise £65,000 a month to operate the service. The helicopter, which is manned by one pilot, one paramedic and usually one doctor, can carry up to two patients.